you work with, make sure you don’t say any of the following things. Stating a fact that should be obvious is always a sign of weakness, and when you are the boss, strength of leadership is THE key component. It also may indicates a stubbornness that is the death knell of a healthy work environment. Your job as a leader is to bring everyone to your level of success, not to create a larger rift. Being a good leader is all about delegation. If you are hiring people who are professional and trustworthy, then this should be a no brainer. It is your job as a leader to get the right people for the job and then lead them in away that means success for everyone. There’s an old saying “The Buck Stops Here.” and that is still true today. Good leaders take responsibility for what happens. They don’t blame others or make excuses. They take the hit for the team and then find the solution to make it better. Not only does it show they have integrity, but it also fosters a warm team environment that makes all players feel like their boss has their back. Treating your employees with respect is mandatory, at the same time there is no reason to be sorry when you ask people to do their job. Leadership is strength and confidence. Expecting your employees to put in the same work ethic as you is your job. Well, why not? Being a successful leader means always being open to change and improvement. No great leader is ever accepting of the status quo. It’s not only lazy, it’s uninspiring and usually leads to a work environment that is stagnate. Yes, keep things that work going, but nothing should ever be untouchable. Creative thinking should never be faced with constant roadblocks. A good option is to always ask for more information. Let your employee show you why they think their way might be better. This gets them energized and excited to approach you with more in the future. No true leader avoids bad news. They confront everything head on because as we said above, they know that ultimately everything is their responsibility, and ignoring a potential problem will most likely end up being worse down the road. Good leaders want to know bad news right away, and the last thing you want is to foster a work environment where employees feel like they have to lie to you. You’re the boss. If someone who works under you is having trouble understanding something, it’s on you to make it clear to them. Getting frustrated makes them less likely to ask for help in the future. Sharing your expertise and experience is not only generous, but a necessary tool in the success of your business. 1. Use Your Friendliness and Optimism to Win Them Over: No one wants a pushy, overly confident salesperson for a REALTOR®. Clients are much more inclined to put their trust in the hands of someone who is friendly when it comes to one of the biggest financial transactions of their lives. A pleasant, outgoing disposition will win you more clients as well as friends. You want to establish rapport in the first few minutes of first meeting prospective clients. Rather than starting with business right off the bat, begin your meeting with some small talk such as similar interests, hobbies, and family life. This will immediately help to put your clients at ease, and show that you are not simply trying to “sell” them something. People also respond well to optimism. During what can be a very stressful time, clients need someone to help them stay positive when a situation looks difficult and challenging. Optimism also tends to radiate charisma, and people want to be around and do business with charismatic people. You want to learn how to understand, motivate, and inspire people. out any potential concerns they might have. After you’ve gained as much information as possible, you can then gauge their interest in your possible solutions by asking “what if” questions. Being inquisitive also demonstrates to your clients that you are genuinely interested and invested in their situation. On the other side of this coin is knowing how to listen empathetically. Empathy involves actually putting yourself or your mind in their shoes so you can genuinely understand their concerns, needs, and opinions. That understanding and empathy is then reflected in your conversation with that client. Your clients want to know that you care about their situation, and that they’re not just another sale for you to make. People are much more willing to put their trust in you when they can sense that you are actually making an effort to feel what they feel in order to understand their situation. Showing your interest through questions, and then thoughtfully listening goes a long way towards gaining trust. Showing empathy and acknowledging the feelings and emotions involved in your clients situation helps build a relationship founded on genuine care and trust. contact to determine how comfortable they are. When someone avoids eye contact that could mean they are not engaged in the conversation. A good way to quickly build a feeling of rapport when first meeting clients is to make eye contact when you first meet them and then start nodding yes to what they’re saying. If the client reciprocates the eye contact and nodding, you’ve established a connection. Choose the right handshake for each client: One handshake does not fit all people, and that first handshake can be crucial to making a good first impression. The way to do a good handshake for each client is to try and mirror the other person’s handshake in strength, keep your shoulders aligned as you are preferably standing when you shake hands. While you shake your client’s hand make sure you make eye contact and give them a sincere smile. Showing a little weakness can actually be to your advantage in this situation, and will actually make others more inclined view you as honest. You don’t want to come across as too good to be true. When revealing this weakness, however, the key to coming out on top is turning what sounds like a weakness into a strength. For example, your service may be more expensive, but that’s because you offer more personalized and extra services than your competitors. Honesty and integrity are the two traits that 98 percent of buyers and sellers report are qualities they consider “very important”. The thing is you can say you have these traits all you want on your website, bio, etc., but trust has to be earned, and the only way to do this is to prove your credibility. When you talk to your clients avoid using filler words such as “um” and “uh”, which can decrease your credibility. You also want to watch the tone of your voice. People tend to translate a deeper tone as sounding more credible. Douglass is also heavily involved with his community, and to that end participates in a local youth soccer charity that provides scholarships for both soccer camps and college. He is also a self-professed animal-lover and donates annually to 11th Hour Rescue, a local no-kill animal shelter. 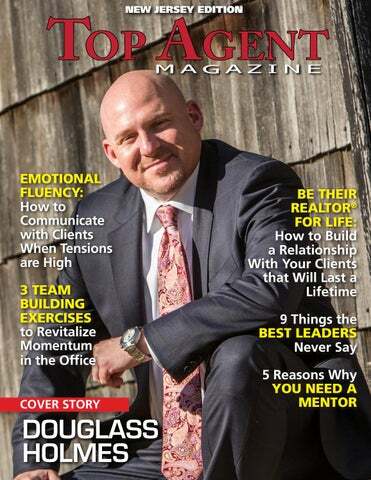 Exceptional, focused marketing also plays a large role in Douglass’s continued success. Professional photography, virtual tours, and floor plans are tools in his highly effective arsenal. He also prides himself on his written descriptions of his listings. Additionally, he utilizes multiple MLS services and a robust social media presence to ensure that his listings are seen by as many potential buyers as possible. members to combine their energies and talents for the better? For starters, add these team-building exercises to your repertoire to inspire natural comradery and momentum in your workplace. If team members aren’t challenged, productivity stagnates and the office loses steam. The same can happen if employees don’t believe their voice is being heard or taken seriously. happen if employees don’t believe their voice is being heard or taken seriously. How should a leader compensate? To curtail negativity and bring a breath of fresh air into the office, give team members a platform to think big, no questions asked. Before your next office-wide meeting, devote a half-hour to visionary thinking. Ask each member of your team to write privately for ten minutes, considering what if scenarios regarding their current roles, career aspirations, and the office’s culture. What do they wish was different? How might things be streamlined? What skills do they wish they possessed? Encourage team members to be imaginative and wrestle with the hurdles or questions they’ve been grappling with. When time is up, split employees into smaller breakout groups and allow them to share their thoughts with one another. Not only will this ignite thoughtful discussion, but it will also allow team members the chance to brainstorm creatively, while articulating their ideas and visions for the road ahead. to sponsoring a golf tournament benefitting area organizations. Either way, service projects unite your team’s energies, afford employees a refreshing change of pace, and positively impact your community. When All Else Fails, Keep it Light Sometimes team members need to blow off steam to avoid office burnout. One way to combat low energy is bring team members together for a lighthearted game. Try office-themed trivia: come up with thirty trivia questions based on your office, then divide team members into competing groups. Encourage groups to think up team names, and organize trivia questions into themed categories. Remember to award fun prizes to create a light incentive. A healthy sense of competition revolving around silly subject matter can get team members loosened up and working together. Concoct questions of moderate difficulty that speak to people’s common ground. For instance, how many tiles are in the office kitchen? Or, how many doors can be found in the office? These questions are light and won’t create any real tension, but will allow a reframing of a stuffy office into a collective home base. Plus, it’ll keep your next holiday party lively. Team-building is an important form of routine maintenance, whose benefits shouldn’t be overlooked. Whatever activity you land on, the overarching idea is to nudge team members beyond their comfortable routines and come together in a new way. At the end of the day, you’ll boost your business, office morale, and colleagues in the process. involved in the process. 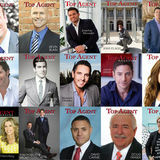 As an agent, you take on the real estate world every day, but most of your clients aren’t well-versed in the norms of the industry and are likely riding an emotional roller coaster throughout. Acknowledging this, how do you steer the ship when emotions and tensions are running high? For starters, it’s not always intuitive. Just like you add tools to your arsenal when it comes to marketing, social media, or lead generation, you also have to add emotional tools to your repertoire. Here are a few ways to diffuse tense situations and keep clients on an even keel—even during the ups and downs of the transactional process. what will happen, they will either envision the worst-case scenario and panic, or they’ll misjudge the next step and be disappointed or left anxious as a result. Minimize surprises by communicating regularly, clearly, and with all options on the table. clearly and with solutions already in hand. Clients are likely to become agitated if a problem arises and they can’t understand why or what it means. That’s why slowing it down, talking it through, and offering potential avenues for recourse can quell fears and remind clients why they chose you to facilitate the transactional process. This means you’ll have to vigilant, proactive, and on the ball. Of course, it’s much easier to be an agent when everything is going great and flowing naturally. It’s when things take an unexpected or negative turn that true talent is really tested. Accordingly, show your clients that you are confident and in control by remaining adaptable, communicative, and clear in your problem-solving approach. needs to feel better. In other words, you don’t have to break out the graphs and data each time a client airs his or her insecurity. First, slow down, listen, and interact on a personal level. You may stop an emotional upheaval in its tracks simply by putting your listening cap on. Not all clients are alike. Some will require a little more hand-holding than others, but it’s your job to put yourself in their perspective, recognize the milestone at hand, and managing the personalities you’re working with. The next time you feel frustrated by a client’s unpredictable emotional energy, keep these insights in mind as you diffuse the situation, steer them to a place of comfort, and fortify your interpersonal skillset in the process. most successful CEOs and entrepreneurs in the country have said that having a mentor early on was instrumental in their success. Here are some of the reasons why. mentor knows exactly what you’re going though, and has probably made every mistake. When you’re in the thick of it, you might not be able to see where the problems are. A knowledgeable outsider, who knows exactly where you’re at and has only your best interests at heart is just what you need. When you have a trusting relationship with someone like that, you will be more willing to listen to that brutal honesty, even if that constructive criticism stings. energy into it. They can see things in a completely logical way and guide you based on the facts rather than emotion. A good mentor helps you work smarter, not harder. They help you focus on your goals and how to get there, as well as setting boundaries for you so you don’t overextend yourself. They teach you how to say no and help you let go when you need to move on from a setback. In addition to expertise, building a strong network is something that can only come with time. A mentor will most likely have that already, giving you access to people and resources that would take others years to gain. These connections will lead to opportunities that might never have happened otherwise. It’s also a great confidence boost knowing that your mentor trusts and believes in you enough to invite you into their inner circle. Years of experience can give someone a great idea of what works and what doesn’t. They’ve seen things first hand, not just in theory. At the same time, mentors recognize the importance of taking chances, calculating risks, as well as cutting losses and moving on. A good mentor isn’t trying to encourage you to be a carbon copy of them, they are trying to create the best ‘you’ possible. That includes encouraging you to take chances, and then being there pushing you to keep going forward if it doesn’t work out. A good mentor knows that even failures can be opportunities. 5. Encouragement At the heart or it all, a mentor offers you encouragement and motivation along the way, in good times and in bad. After a failure, it can be hard to get back on track and keep forging ahead. It helps to have someone who has spent year getting back up after being known down and coming out stronger than ever. It’s during those moments, when you feel alone and isolated, that having someone around offering you advice and positive feedback will be a much needed salve. They’re your cheerleader, they want you to succeed, and hopefully, you’ll pay it forward one day when you become as successful as them.